"I know men and recognize them by their behavior, by the totality of their deed, by the consequences caused in life by their presence." After the fall of France, Monod was a researcher at the Sorbonne, studying a puzzling behavior of bacteria that would ultimately lead some 25 years later to a Nobel Prize. As the German noose progressively tightened around France, however, his more immediate concern was the liberation of his country, so he sent his Jewish wife and his children to live outside the capital, and joined the most militant Resistant group. 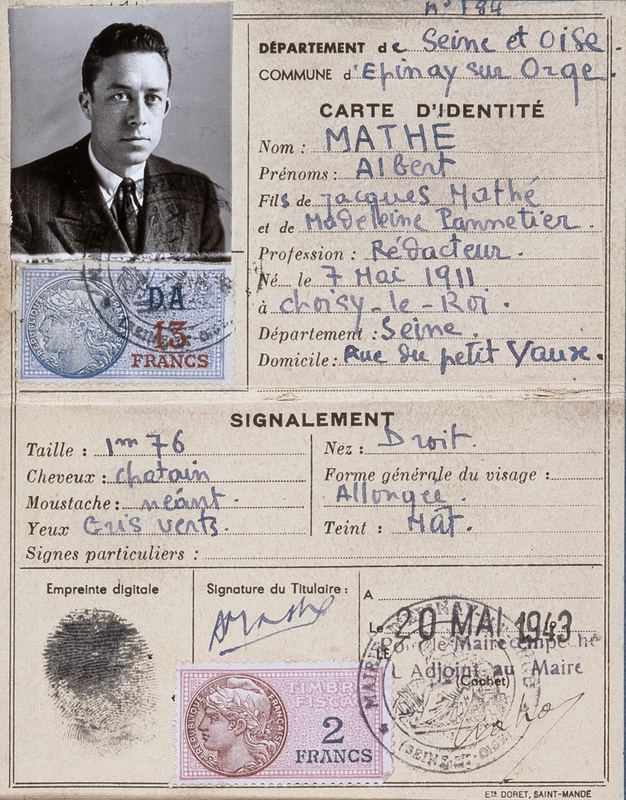 Using the alias "Malivert," he rose to become a high-ranking staff officer of the national resistance organization, the FFI, and participated in the liberation of Paris. After the war, Monod hurled himself back into scientific research, but he also maintained his commitment to the cause of freedom. Monod's outspoken opposition to what he called the "ideological terrorism" of the Soviet Union spurred his friendship with Albert Camus. After receiving the Nobel Prize, Monod became a prominent public figure and a best-selling author with his provocative book Chance and Necessity, which examined the philosophical implications of the discoveries of modern biology. Camus came to Paris from Algeria in March of 1940, an aspiring but completely unknown writer, and found work as a layout designed for a mediocre newspaper. By 1944, he was the editor of the resistance newspaper Combat. In inspiring but necessarily anonymous editorials, Camus exhorted Frenchmen to take action against the German occupiers. Only after the liberation of Paris did readers discover who had composed such stirring prose, and they loved him for it. After the war, Camus assumed a very prominent public profile. His editorials, essays, and novels offered a war-weary public some reasoned hope for a brighter future. He was a leading voice for human rights and freedom around the world, and against Marxism and Stalinism -- positions that were also espoused by his friend Jacques Monod. Camus was awarded the Nobel Prize for Literature in 1957 at age 44 for "his important literary production, which with clear-sighted earnestness illuminates the problems of the human conscience in our times." His novel The Stranger is widely considered one of the great classics of twentieth-century literature. A music student during the German occupation, Noufflard was part of a youth chorus directed by Monod when she approached him about joining the Resistance. Noufflard became Monod's liaison agent. She made daily rounds about Paris passing along messages to and gathering intelligence reports from other resistance members - - information that was used to mount sabotage operations and to guide the Allied bombing effort. Noufflard and Monod were in the thick of the dramatic battle for the liberation of Paris. Now 93, Noufflard still lives in the same home out of which she and Monod conducted much of their Resistance work. A nineteen-year-old medical student and aspiring surgeon at the time of the German invasion, Jacob escaped France and joined de Gaulle's Free French forces as a medic. After four years of fighting in Africa, Jacob was very badly wounded in Normandy by a bomb. His injuries ended any possibility of becoming a surgeon. After the war, Jacob sought work in medical research, which eventually led him to the Pasteur Institute, where he was just down the hall from Jacques Monod. He and Monod joined forces in 1957, and their groundbreaking discoveries about how genes work earned the 1965 Nobel Prize for Physiology or Medicine. A biochemist trained in Hungary, Ullmann was deeply involved in the failed revolution of 1956. When she managed to visit Monod's Paris lab in 1958, she divulged that she wanted to defect from Hungary with her husband. Although he was immersed at the time in the very research with Francois Jacob that would win the Nobel Prize, Monod offered to work to arrange their risky escape across the tightly controlled border. Using coded messages to communicate with Ullmann, Monod and his accomplice developed several different escape plans that finally led ito Ullmann and her husband being smuggled into Austria, hidden underneath a bathtub in a compartment of a pull-along camping trailer. Ullmann is still working at the Pasteur Institute 53 years later.